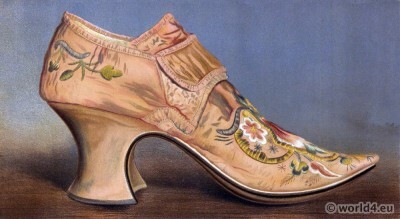 Large buckled shoe baroque fashion period. Home » Large buckled shoe baroque fashion period. 17th century large buckled shoe. Baroque fashion period. THIS large buckled shoe was worn in the reign of Queen Anne (6 February 1665 – 1 August 1714), though, unfortunately, the name of its owner cannot be ascertained. The material is pink silk; the embroidery in silks and metallic threads is very rich, and the colours wonderfully preserved. The heel is of an immense height and breadth, and the toe so extravagantly pointed, that it must have protruded for a considerable distance beyond the foot. Gallery: Ladies’ old-fashioned shoes by T. Watson Greig 1885. This entry was posted in 17th Century, Baroque, England, Shoes and tagged Baroque fashion, Ladies' old-fashioned shoes on 8/24/14 by world4.